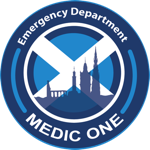 Edinburgh Emergency Medicine - Seeking the Answer...Or Not? Brian has had a tough few days. He is 48 years old, owns his own small business in Musselburgh, and austerity has had its effect on him as on many others. He has had to make cuts in his business and home life, and he feels the pressure of the squeeze acutely. Over the last 36 hours, he has been experiencing a dull ache in his chest. It started in the middle at the front, and he put it down to some indigestion, but it has now moved up to his left shoulder, and it doesn't seem to be shifting despite some antacids and paracetamol. He is worried - "What if I'm having a heart attack?" He makes his own way to the Emergency Department, and is greeted by our triage team. Here, the presenting complaint of chest pain is established, and a very brief story of the pain, and any other symptoms, is taken, so we can start the process of investigating possible causes as quickly as possible. We also try and ascertain what it is Brian is concerned about, and start to set the scene for how his visit to the Emergency Department will pan out. Rather than seeking an absolute diagnosis from a list of many, what our assessment process in the Emergency Department aims to do is ensure we have understood the potential causes for Brian's pain that could either prove dangerous to Brian if missed (like lung cancer or a pulmonary embolus) or be amenable to time-critical treatment (like a heart attack), or both. We will systematically consider these diagnoses, and will try and exclude them as best as we can with a mixture of clinical assessment, experience, laboratory and radiological investigations, and sometimes admission for further observation and sequential tests. The first priority is to get an ECG (heart tracing). This test may tell us if rapidly if Brian is having a heart attack that may respond to rapid coronary artery interventions. However, ECGs only show signs of a heart attack in patients who are having them about 5-6 times out of 10. This means that if we relied on just a single ECG, we would miss up to half of all heart attacks. But if that initial ECG does show signs of a heart attack, it is rarely wrong. It is what is termed a "specific" test - reliable when positive, but not so good when negative. So once Brian has had an ECG, it is reviewed by one of the medical team, and fortunately it shows no signs of a heart attack. This is good news for Brian, and takes him one step closer to us being able to confidently exclude a critical problem with his heart and its blood supply. The next step involves getting more detail of the way Brian's pain came on, how it changed, what other symptoms were experienced at the same time, and building up a really detailed picture of Brian's recent condition, as well as any pre-existing medical or social factors (smoking, alcohol use etc.). This will further help us understand what other conditions could be responsible, or not, and will guide how we further investigate Brian with X-rays and blood tests. This is followed by a careful focussed physical examination, looking for other cardinal signs of serious illness, and then a chest X-ray and some blood tests. One of the blood tests measures one of the proteins that only exists in heart muscle, and which is released if any of this muscular tissue is damaged in a heart attack, however small. This blood test is now able to measure incredibly tiny amounts of this protein, so even in seemingly very slight blockages in the heart blood supply, we can now detect if the heart has been damaged. If this blood test is negative, it is very strong predictor that the symptoms with which Brian presented to the ED are not related to a heart attack on this visit to the ED. With all these tests reassuringly negative, we are able to tell Brian as categorically as we can that it is highly improbable that he has had a heart attack, and that there is nothing to suggest his current symptoms represent a danger to him.